The Sado complex of heritage mines, primarily gold mines is part of the Tentative list of Japan in order to qualify for inclusion in the World Heritage List. Sado Island is a short ferry ride away from Niigata, which has good connections from Tokyo naturally, but also others such as Sapporo, Fukuoka. The main destination for Niigata is usually to see tehe golden leaf season which is in late autumn. 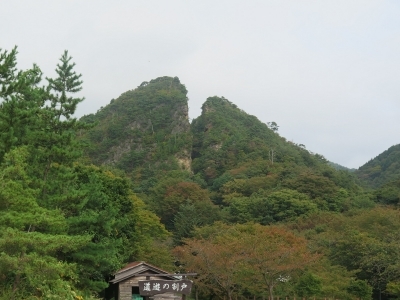 Another reason would be the mines on Sado island, but Sado itself has several places to visit such as the Toki Forest Park. The mines are unfortunately quite far away from the towns. There is a bus to the west coast and you would have to change again to reach the mines but that second bus time schedule is quite infrequent. So it is doable by public transport but I highly suggest you get that International Driving Permit for renting a car from the ferry port. If you are more than one person it is already worth it and the distances are not far. The locals drive very slowly here so you need to get used to that. The tourist information center at the ferry port also has an excellent map for all the attractions which can easily be stretched to a two day visit. Once you get to the west coast the scenery becomes really green and beautiful. It would be worth driving along the coast north and back towards the ferry port from there if you have the time on hand. The hills really look like you just landed on a different island in comparison to the flat areas of east Sado. The Sado gold mines are easy to find and has plenty of parking. They didn't speak any English but buying a ticket is made easy with the English pamphlet that offers several options. Option 1 and 2 are simply visits to the mines on your own. If you are in a group you can book a your guide ahead but I think it would be in Japanese. Mine A is rather boring. You get to read some wooden boards about the mining techniques. It appears what the find special here is the imported techniques from other countries to improve the mining. Some from China and some from Europe. It will take around 20 minutes to get through this mine and then you get to a museum which is another 10 minutes or so. The odded thing was a giant gold brick in a plastic case with a hole big enough for your arm to reach in. If you can reach in, grab the brick and pull it out you win some price - but it is actually impossible to do so from the design already. Your arm cannot reach in properly and even if you finally reach the gold brick there is no grip on it as it is so heavy... The museum is almost entirely in Japanese though so you can look at the miniature models and the reconstructed mine shaft (or whatever that was) but you will not take too much time here. Both mine visits end up at the museum shop so don't buy anything yet if you are still going back to the entrance as you don't want to carry it around and up the hill. There are vending machines (hey, it's Japan!) for refreshments and I think in summer time there is a small cafe that opens. Mine B goes along the cart tracks and leads to outside. The scenery outside is great and the small hike up to the collapsed mountain is worth it although the numbering was confusing and I almost missed this part. There are warning signs that you should not go inside the fenced off area but there are also clear signs that people still do from leaving some cigarette butts and snack bars in the bushes past the fence. The area between the mine shafts has an old shed with machinery. In a typical Japanese style they even managed to get a super clean toilet into the building across. Once you get through another mine shaft the view takes you further away from the collapsed mountain but this view is amazing. Stroll along for a few across the countryside and it leads back to the shed and you can take the same mine shaft to the exit to finish this tour. Totally worth going for the combo ticket to see it all. The golden ticket also made me feel like I'm going to a Chocolate Factory soon. I treated it like it was gold and sealed it off in a small bag to ensure it would get back home in mint condition. If you only have time (due to that bus schedule) then do the mine that leads outside.